I grew up attending a small church. It was very different from the church we attend now. You could probably fit the whole church in our choir loft - with room to spare. I gave my heart to Jesus in that little church (any number of times, being the kind of little girl who wanted to be very sure). It was during those years that a firm faith foundation was laid. I am forever grateful for the truths that were planted in a tender heart. However, it was a very traditional church. We didn't do things like clap or raise our hands - absolutely not. Ours was a quiet, staid congregation - at least during service (and truly, there is nothing wrong with that). So it came as quite a shock to me the first time we stood for worship in an interdenominational church and the people around me tilted their heads heaven-ward, closed their eyes and raised their hands. In all honesty my thoughts went something like this: "Are their lives so perfect they can stand before God and everyone and worship in that way? Because, really, unless you are totally right before God you couldn't do that." My legalistic little mind couldn't imagine such a thing. But there was something there I knew I'd been searching for. 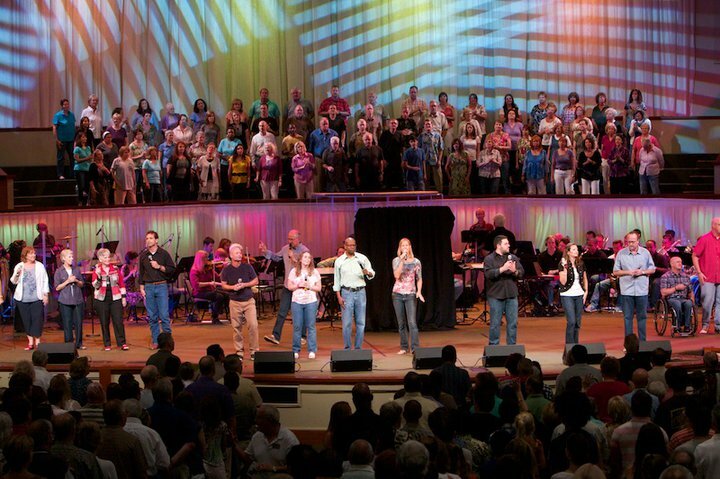 We began to attend regularly, and I learned something about worship. It isn't about me. Imagine that! It's all about Him - and He is more than worthy. Before long, I found it impossible to stand with my hands at my sides. I had a deep longing to reach out to Him and tell Him how amazing and wonderful I thought He was. For the past few years, my husband and I have been singing in the choir. I can't begin to describe the absolute blessing it is to be a part of this group of worshipers. Some weekends the choir loft is pretty crowded, and we stand shoulder to shoulder . We begin to sing words of praise - arms bump and hands get tangled up - and I imagine the Father looking with love-filled eyes at His children worshiping together. Joining Emily for tuesdays unwrapped. In a way I envy you, Linda. Where I go there is no emotion shone. What a beautiful image you left me with - all God's people, His body, worshiping together. Beautiful! I've imagined many times the Body of Christ in heaven learning what true worship is, for now I am thankful for all worship which blesses our Lord.